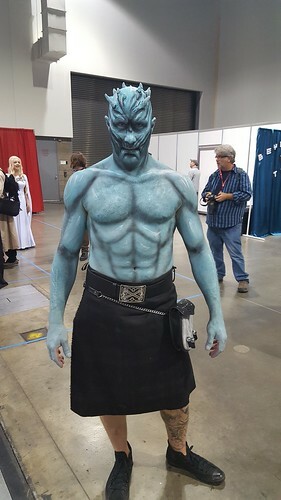 The feared King of Wights made his cold presence known. Daenerys and Khal Drogo - I think couple COSPLAY was amazingly good. There were a few Daenerys Stormborns floating around some with pet dragons perched on their shoulders. I have not found pictures of all of them. There is one in particular I thought was really good and I can't find a picture of her. 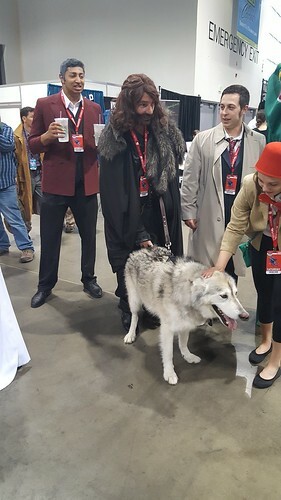 Jon Snow - I saw a few Jon Snows. One even had a stuff animal white puppy in his arms representing his wolf Ghost. Ok and the best of all was this Arya Stark who is just a complete doppelganger of the Arya on the show. I almost asked her for her autograph she looks so similar.